We forgot about Myrtle for a while, and when we went to look for her she was nowhere to be found! I looked for ages in all of her usual haunts, but I couldn’t find her 😦 Hopefully she will be ok overnight as it is lots warmer than it was a few days ago & no rain is forecast! 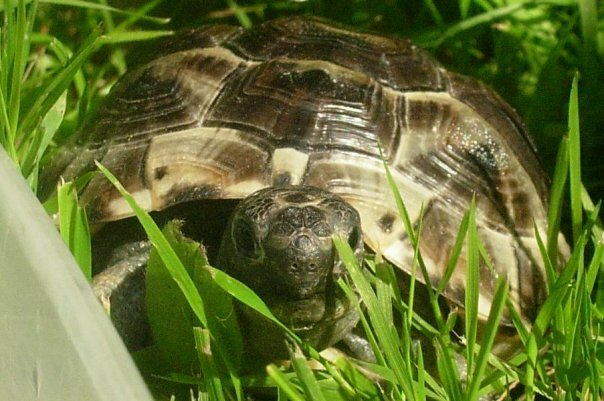 This entry was posted in Myrtle, Pets and tagged Greek Spur Thighed Tortoise, Missing Tortoise, Tortoises in the garden. Bookmark the permalink. 6 Responses to … Myrtle is Missing! We found her!! She was in the shed! Clever Tortoise!! I was worried she might have fallen in the pond. Have some photos but I have temporarily (I hope) mislaid my camera!! PS camera is at home Phew!! Trying to train Wilson to find Myrtle would be a way forward! Any Ideas? So far he insists on only finding balls & sticks!! I guess you could call this episode with Myrtle kind of a “shell game”.